Whether you want to learn how to ride a bike or learn to race, Apex Racing Academy caters to all. So go on, stop just watching Valentino Rossi and Jorge Lorenzo on TV… practice and BE them! Have you often caught yourself lingering a moment too long when you see a biker on the road enjoying his ride? Well, how about you take it a step further and actually learn to ride or even better, learn to race? So, unlearn all your street riding and understand your bike at Apex. With three levels to choose from, you’ll learn the basics of riding a bike before then going onto track riding. At level 3, you’ll learn advanced body positions and expert riding so you’ll be a pro on track. For those who know how to ride, Apex will open your eyes to the science behind it. Providing a safe space for learning, exploring and excelling Apex encourages you to develop the skill behind riding. 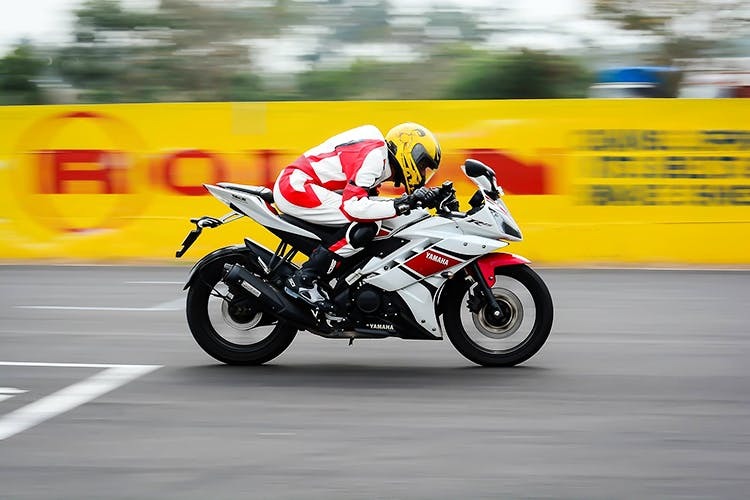 Their classes take place over the weekend and students are taken to their racetracks in Coimbatore and Chennai. Racing and travel… what fun! If you are truly interested in a racing career, Apex has its own competitive racing team. After completing all the levels, if you qualify, they will help you get your certification, and then you’ll be eligible to participate in competitive racing. If you don’t want to go pro, sign up for the Open Track Sessions where anyone who has completed a track motorcycle course at a recognised premier academy can book the track and enjoy a day of racing and practice. So indulge in your speedy desires and learn more than just riding, with Apex Racing Academy.